As I’m sitting on my couch with barely enough strength to type, I’m happy the long week of team bonding is over for some recovery and relaxation, but even happier that we got the chance to do all of the activities that we could. 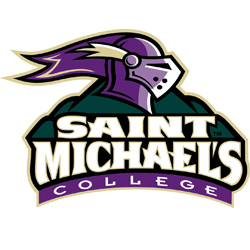 After a long weekend with Monday and Tuesday off from classes, we re-united with the team Tuesday night to support the Saint Michael’s women’s volleyball team. We were excited to watch another team compete while we had the opportunity to relax and simply cheer. It was an added bonus that they snagged a win over Franklin Pierce. However, both teams had an awesome game! 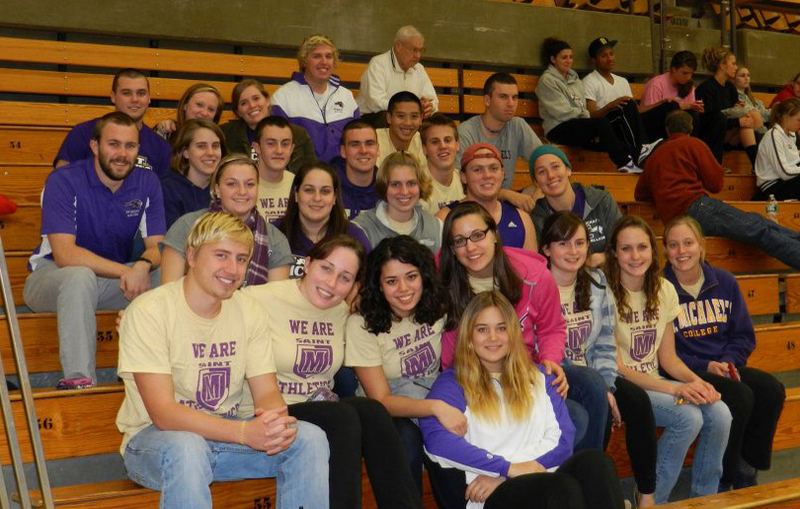 On Friday, we continued the team bonding with an intra-team mock meet, Purple vs. Gold. 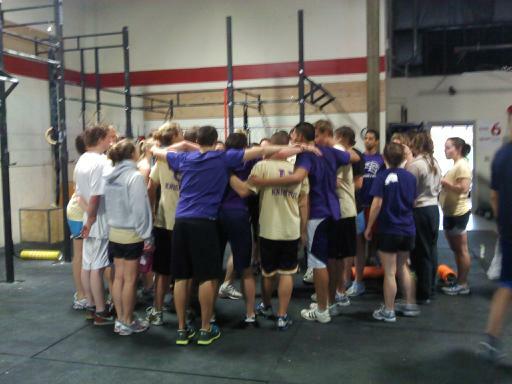 Although the lot of us on Purple swam hard, we were defeated by a couple points by team Gold. It was great to take the time to watch the newbies swim their first college race and have the divers in the pool with us. With less than two weeks to go until our first meet, I can safely say our swimming and our cheering are ready for some competition. With only one day of official Crossfit practice this past week, we were eager to have a week of less soreness; however, we didn’t know quite what was in store for us during the weekend. We spent Saturday morning working on team goal building; sharing something valuable to us, playing games about how well we know one another, documenting a list of our goals for the season both individually and as a team, as well as a surprise guest speaker. Our speaker was the one and only Bob Hall, our head coach’s husband who inspired us to be the Chuck Norris in our lives. His message was all about optimism and how important it is to keep in mind that life doesn’t happen to you, but you happen to life. Because we all know that when Chuck Norris jumps into the water, he doesn’t get wet; the water gets Chuck Norris. Following our 3-hour goal building session, we loaded up and headed to the Crossfit Gym in Burlington; our Crossfit coach’s very own heaven here on earth. 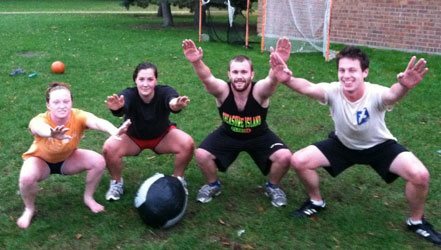 Joining us at the gym was a dozen of Middlebury College’s swim team, who also participate actively in Crossfit. We spent 3 hours working hard with some Crossfit drills, such as pull ups, lifting, push ups, and even pulling 70 lb sleds (for the girls, those manly men had sleds weighing over 100 lbs!). In between strenuous sets we discussed important nutrition for athletes, as well as the important movements and recovery techniques after working out, including rolling the knots out of our muscles with lacrosse balls. Painful, but necessary. Some of the boys on the Middlebury team stepped up and discussed their participation in Paleo Diet, stressing the importance of returning to our roots when eating by staying away from processed foods. (Check out more about Paleo: http://thepaleodiet.com/). During our winding down portion of the afternoon focusing on recovery, the Middkids explained to us their technique of the Zen Warrior. Even when it’s excruciatingly painful, keep that game face on. This may have been the most difficult part of the whole experience for us. Practicing Crossfit with another active college team was extremely beneficial and hopefully a new tradition for both of out teams. I think both teams gave one another a run for their money and we had the opportunity to put on some competitive game faces. With less than two weeks left to go until our first meet, we’ll be focusing a lot on fast practices and intense Crossfit action. We’re anxious to watch some records get broken and personal best times to be made. Keep checking in and don’t forget to be the Chuck Norris in your life! And so the first week of swimming has ended. Not only our first week in the pool, but also our first week of Crossfit, our first team meeting, and our first team get together outside of practice hours. Although it has been raining here for what feels like 3 consecutive days, we braved the weather for a swim team barbeque this past Saturday. Most of us stayed dry inside, but thankfully the boys’ captain stood in the rain for us to grill up some burgers and dogs. Getting to know the new freshmen and transfers, as well as re-uniting with the upperclassmen for longer than an out-of-breath quick conversation between sets made for a great dinner. Our Crossfit coach gave us a lovely surprise on Wednesday afternoon by allowing us a half hour of venting time instead of continuing to work our squats. As the middle of the semester quickly approaches, everyone on the team can feel the stress of school and the added scheduling in of swim practice. Spotting some anxiety throughout the team, the upperclassmen decided to offer some words of advice of how to keep calm when school takes over for the college newbies. Having learned a few tips myself, I decided to share them. They’re suggestions that can essentially help any college athlete succeed with the time crunch of practice, school, and somehow finding time for a social life and sleep. 1. Actually come to practice. It forces you to manage your time instead of napping your afternoon away. It also serves as a break from the constant movement of school work. It gives you endorphins to relieve your stress and allows for time to joke around with your teammates. 2. Keep in close contact with your teachers. If they know you on a more personal basis, then they’ll be more flexible around your games or meets, as well as being more accessible when you’re struggling with schoolwork and requesting extensions. 3. If you’re feeling overwhelmed, don’t be embarrassed to seek help. Whether that’s with a study group, a tutor, or a one-time guidance session with the writing center. These programs are set up for the use of students and are very accommodating around school and practice schedules. 4. Give yourself a day off. For most, this day would be a Saturday, which is mostly when we all have sporting events so it works out nicely. Sundays were set up to do homework, anyways. 5. Find a study space that’s not your own bed. You will be convinced way more easily to close your eyes instead of studying when compared to sitting at a desk in the quiet of the library. Wise words from the SMC swim team. Keep following and I’ll keep you updated! After Day Two of regular season practice starting here at St. Mike’s, I think the general consensus throughout the team is that of being sore. The initial jump back into the pool can be as much of a reality check as the cold water in late September after having avoided it as much as possible since Championships last year. This 5 month long sport is just beginning and I’ll be here to keep you updated! I wish I remember the first time I jumped in a pool. I wish I remember when I first learned to dive. I wish I remember finishing my first test set, or first 25 in a meet, or first early morning sunrise drive to a meet with mom. But I was five, or younger. So I don’t. What I do remember, is being in love with swimming my entire life. Not the moment it first happened or all of the moments that love shifted and grew, but I know that it has always been there. Just like swimming has been there for me from the beginning. Keeping me grounded, happy, secure, always providing an outlet, and never letting me down. Even when everything else seemed wrong, swimming was always there. This being the last year, the first practice is a little bittersweet. As will be the first meet, the first team dinner, the first team meeting, and trust me, I could go on all day. While reminiscing on those firsts, it’s hard not to recognize what this actually means regarding this being my last year. All the firsts this year will be memorable, but the lasts will be even more-so. Even more significant, even more note-worthy, and even more heart-wrenching. It’s hard to not focus all of my attention on the very last of this whole experience. The last time touching the wall in the 800 free relay in the last meet of the season. The last time I do pre-race rituals. The last time staring up at that clock that determines whether I finally snagged the backstroke school records. The last time I hear my mom yell my name when it’s quiet right before the starter goes off. The last time I look up at her in the stands just as excited as I am. 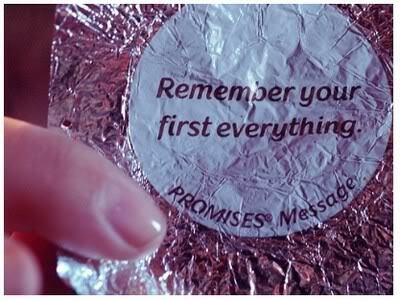 I don’t remember all of the firsts, but I will remember all of the lasts. And I will never forget what swimming has done for me. Join me on my trek through my last year of competitive swimming. 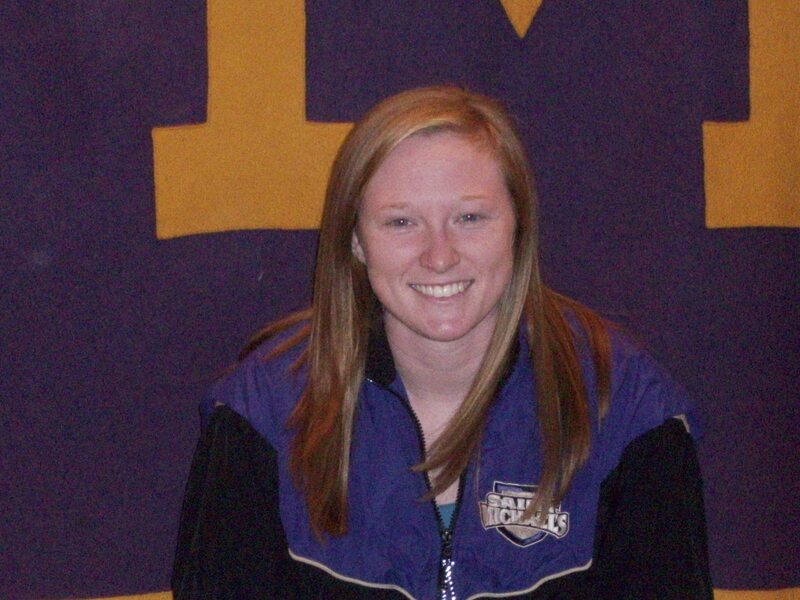 Kelley, a backstroke and freestyle specialist, heads into her fourth year on the swimming & diving team this winter. Kelley has her name on five school records, including the 200-yard individual medley, 200- and 400-yard freestyle relays, and the 200- and 400-yard medley relays. After studying in Australia last fall semester, Kelley swam for the fifth-place 200-yard freestyle relay team and a trio of seventh-place relay foursomes at February’s NE-10 Championship.